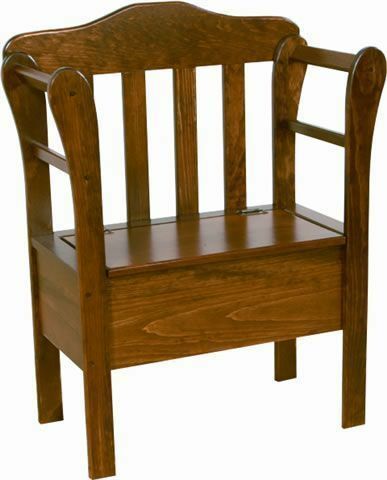 This Amish handcrafted Pine Storage Bench is perfect for the foyer or entryway. This also makes a great mud room bench. The seat on this storage bench lifts up so that you can keep many different things hidden away and out of site. Your entryway will be organized and stylish with this Amish pine storage bench. You can put bags, purses, shoes, a blanket, pet accessories, toys, or whatever you want in the storage area. This Amish bench can be customized by selecting a finish that matches your personal style and home decor. This pieces is built by the Amish in the countryside of Lancaster County. Built from Eastern white pine wood, this small storage bench is handcrafted to last you many years. It could even become a piece that you pass down to your children and your children's children. If you have any questions about this storage bench or any other piece of furniture call our Furniture Specialists today or visit us at our Amish furniture store in Sarasota, Florida. Use the storage bench to store shoes at the doorway. Recommended for anyone who wants to preserve and protect their flooring. I am so happy with my purchase! This hutch and bench are absolutely beautiful! I have the most beautiful dining room now!